﻿Private one on one music instruction is given Monday thru Saturday﻿ on all instruments and in all styles. At Village Music Shoppe we understand the importance of teaching reading music with theory and technique as well as incorporating popular music into the students daily playing. We teach students from 5 years old and up, we have students of all ages and skill levels and have over 15 teachers to choose from. 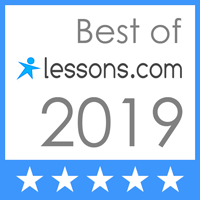 Lessons are one half hour long, once a week and are one on one with the teacher, and are designed to work specifically with the student and their abilities. ​​"Taking lessons at the Village Music Shoppe in Mastic has been one of the best things I've done in a very long time . Chuck and Bonnie have created a warm, fun , and relaxed place to learn. Teaching you how to play an instrument and more importantly how to be a musician. In my case learning to play the guitar. Chucks vast experience and technical knowledge along with his expert teaching methods are far superior then anyone around. ​"Our family first got to know Chuck and Bonnie when my son took his first guitar lessons and it was obvious that Chuck is a great, patient teacher who adapts his lessons to a student's personal musical tastes and needs. As an adult player who knew the basics but had never really had any formal guitar training, Chuck has helped me improve my technique tremendously by listening carefully and then designing drills to focus on my weaknesses. The best compliment I can give is that my bandmates immediately noticed the improvement in my timing and lead work after I started with the lessons and now I am much more comfortable singing and playing at the same time. For expert lessons call us 631-874-8425 or visit the store.